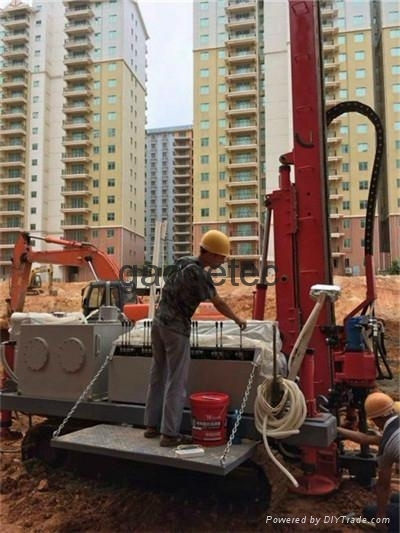 Crawler full hydraulic engineering drilling machine is designed for anchorage design and strengthen the government various complex strata and geological disasters. Slope anchor drilling machine can be used for ordinary rotary drilling, drilling and casing pipe (tube) composite drilling, DTH hammer drilling, and the automatic high pressure jet grouting, etc.GM - 5 drill is specially applied to the support of foundation pit and slope anchor rod (rope), the rotary club of anti-floating anchor rod, anchor spray and various pore forming and other projects. For more information about jet grouting drilling rig, please email us: info@gaodetec.com.